Today, I want to talk a little about your garden hose and the sprayer that goes on the male end of the hose. It seems that no matter what style sprayer I use, be it a pistol, wand, bubbler or sprinkler, I always end up with something that leaks. I can start off with new washer and tighten it as tight as possible, but before long, water is leaking at the connection. You know the feeling. It can be very frustrating when you are trying to conserve water and not make a mess, but with every twist of the sprayer the hose comes loose. Enter the Gilmour Metal Quick Connector Set (Model #09QC). Metal?…..yes metal. It’s made of quality steel and brass. It has a nice rubber ring around each piece. These grip the knurled brass under them. They are large enough to get your hands around them for the initial installation and also provide a good grip for disconnecting and reconnecting. The body is made of brass and the connecting pieces are made of steel. Now I’ve tried those plastic snap connector sets, year after year after year. They either leak at the snap connection or the sun eats them up to the point where the swivel gets loose and falls apart. They always feel fragile and leave me wondering if I going to snap them in half if I pull on the hose the wrong way. Not so with this Gilmour metal set. I put the male end on one of my pistol grip sprayers, along with a fresh washer. The female went end on the hose. That end has the washer installed. I tightened them up hand tight, plus a little oomph. I then snapped the two pieces together and turned on the water. Expecting this snap connector set to perform like those of the past, I was pleasantly surprised when all I heard was the water fill the hose and then………..silence. No hiss of a loose, dripping connection. I picked it up and twisted the hose around a little and still………..silent and dry, not a drip! There are no leaks because the swivel portion is manufactured very nicely so that there is very little play or slop. The result is that I now have a nice smooth swivel connection on the end of my garden hose. I can easily bend, twist or stretch my arm to reach that hard to get to plant for watering without having the hose turn into a pretzel and fighting me with every move. I can walk away from it knowing that I’m not slowly, drip by drip, watering the driveway. And, with a few more of the female halves (which are available separately) I can swap sprayers easily and quickly. For me, the Gilmour Metal Quick Connector Set does what it is supposed to do and has performed beyond my expectations. This quick connection set provides a drip-less, snap on-snap off, swivel connection. 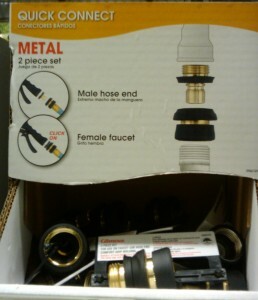 I’m going to get a few more for the hoses in my yard and I recommend that you try one as well. I think you will be pleased with the results.